Mel Martinez (born October 23, 1946) is an American politician. 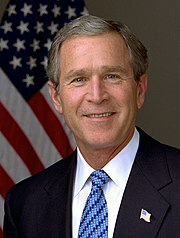 He represented Florida in the United States Senate from 2005 until 2009. He was the 12th United States Secretary of Housing and Urban Development. He is a Republican. Martinez was born on October 23, 1946 in Sagua La Grande, Cuba. He graduated from Florida State University. He is married to Kitty Martínez. They have three children. ↑ "Martinez, Melquiades R. (Mel)". Office of Art and Archives and Office of the Historian, The United States Congress. Retrieved July 30, 2015. This page was last changed on 8 March 2017, at 04:51.